Today is a very special day for us. Yes! Its our wedding anniversary. Life has shown its true colors and it still feels smooth and secured when we face it together. Thank Lord and our family. This is the first time, my husband is so busy that he couldn't apply a leave. Hmm! Spend morning with my son going through our marriage album and answering his cute innocent questions. 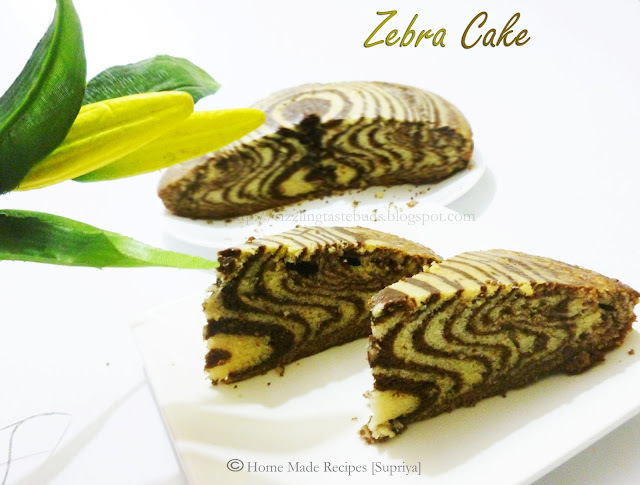 Baked this Zebra Cake for the occasion and packed some for my hubby's lunch box. Just got a call that its a hit there in his office. Thought of baking something else but couldn't find some ingredients. 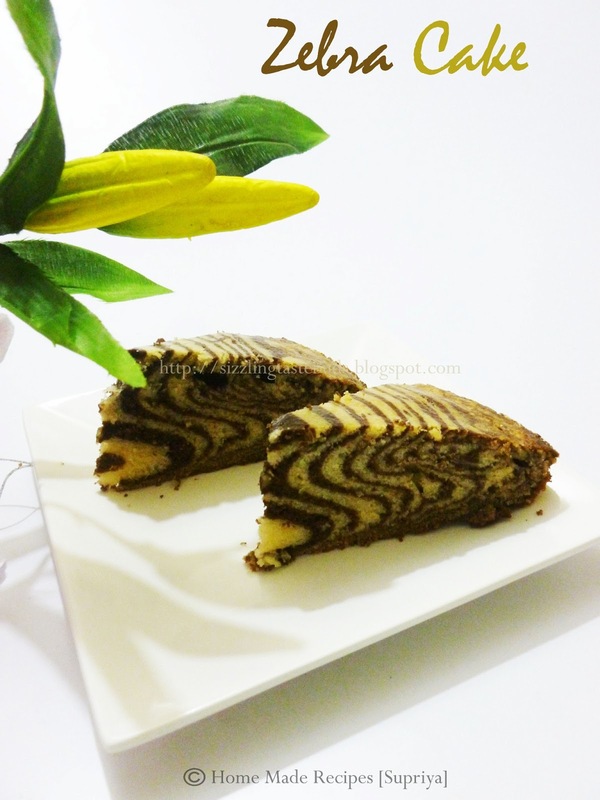 So ended up baking my all time favorite zebra cake. Vanilla Sponge Cake is our all time favorite cake and so planned this for the celebration giving it some striped zebra effect. 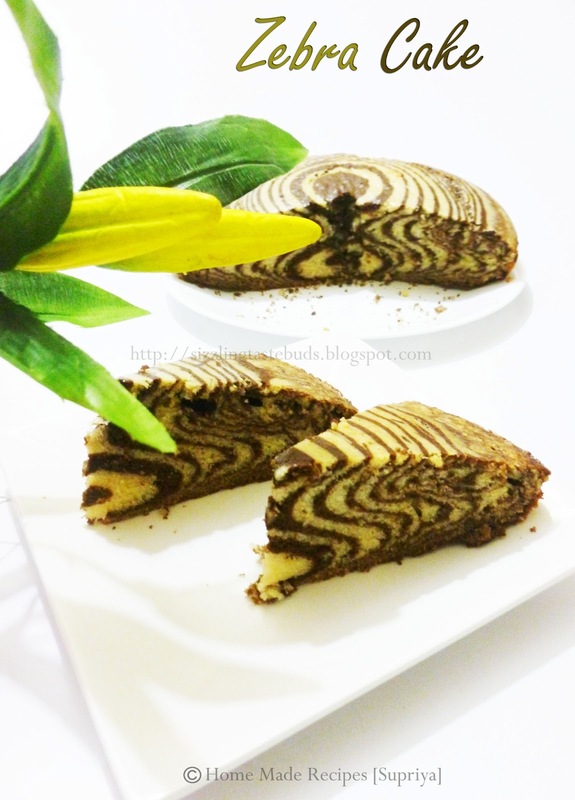 Click here for the Vanilla Cake Recipe. Both my super heroes loved the cake and I have saved some for my parents too whom we will be meeting in the evening. 1. Refer Vanilla cake here. Divide the cake batter into two equal halves. Add cocoa powder to one bowl and mix it thoroughly. Add little milk if you find the mixture too hard/ thick. Keep the other bowl plain. 1. Lightly grease the round cake tin with little oil or line it with a parchment(baking) paper. 2. Take a ladle full of plain vanilla batter and pour it into the middle of the baking tin. Then carefully pour another ladle full of cocoa batter on top of the vanilla batter. Repeat the process till both the bowl are empty. Do not spread the batter to distribute the mixture. It will spread and fill the pan gradually. You just keep on alternating the batters till you finish both the bowls. 3. Once done, carefully keep it in oven for baking at 180C for 45 to 50 mins. Cake is ready when a toothpick inserted in the center comes out clean. Remove the Cake from the oven. Carefully run a knife at the sides of the tin with knife and invert it on a plate. Once its cooled, cut and enjoy the Zebra Cake. Cake looks so perfect! Congratulations dear! Happy wedding anniversary supriya...Cake looks wonderful perfectly made dear.. Happy anniversary.. The zebra pattern has come out perfectly.. Delicious cake!